Ever since I made tea smoked chicken I am hooked. The meat has such deep rich flavour and texture of meat is so tender and juicy. I now tried tea smoked belly. As expected the flavour and texture is excellent. This is probably the best piece of porky I have made. The meat is cured with soy sauce and spices, the curing salt makes the meat a lovely pink colour. Mix all the marinade ingredients together. Put meat in a ziplock bag, pour in the marinade and spread the spices evenly. Seal bag and leave in the fridge to cure for a week, turning the meat once or twice during the curing time. The meat will be cooked by steaming. Remove all the spices from the meat. Put meat on a rack in a steamer. Let the water come to a boil then lower the heat to low, steam for about 45 - 50 min. If using a much smaller piece of meat reduce steaming time by about 10 min. The meat is ready for smoking straight after steaming. I used the same stainless steel steamer for smoking. If using a steel steamer like mine, make sure it is thoroughly cleaned before smoking, any grease will leave a burnt stain. You can use a large pot or wok with a lid. Do not use bamboo steamer the smoke will damage it. Do line the smoker or whatever pot or pan you are using with several layers of foil to prevent leakage and save cleaning. Cleaning a nasty burnt pan is painful. Line the pan/wok with several layers of aluminium foil. Spread the smoking ingredients evenly. Put on a rack place meat on rack with the skin side up. Cover and turn heat on to medium low. Wait till you can see white smoke, turn heat down to very low. Slowly smoke the meat for about 30 - 35 minutes till the meat surface is dark brown. When done turn the heat off and let the meat cool inside the smoker. When cooled ready for slicing and serving. 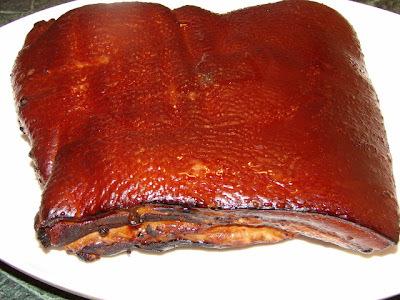 The skin is soft and slightly chewy and meat is rich and flavourful. The meat is good too after chilling and will keep in the fridge for a week or more. Once chilled the skin is chewier. * for more details about smoking see this tea smoked chicken recipe. 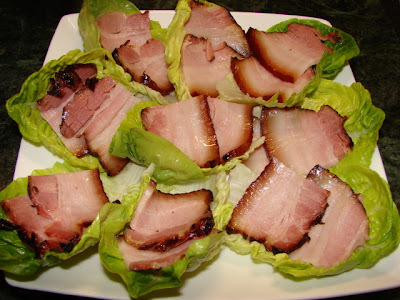 Here I sliced the meat very thin and eaten with lettuce. Where are you from? Curing salt #1 (pink salt) is available from US, UK and possibly Australia from specialise shop selling sausage making and meat curing products. I have plenty you can contact me. this is really delicious, i love pork belly and this is one i must try. Would you please tell me when did you get your pink curing salt from? I live in Kent, and I checked online where can I possibly get hold of this salt, just not possible. I got mine from US. Sausagemaking.org (UK site) used to sell it but I just checked they have stopped doing it. Nevermind do contact me by email you can get some from me. I also have plenty of #2 cure salt. If you have saltpetre you can use it instead but I don't really know how much. I try to steer away from saltpetre, pink salt is safer to use. I have made English bacon with this curing salt many times. This is indeed the recipe I have been looking for and I am going to practise it until I can do it for Chinese new Year next year!! But have to source the curing salt from some friends...thanks. God bless. Hi! I know this is an old,post but may i know where i can buy the curing salt here in sg? Thank you! Sorry I don't live in SG. You can contact me by email. Absolutely delicious recipe. Just be careful, the second time I made it, i didn't make sure that the aluminum foil layers were in firm contact with the wok. It seemed to take forever to get any smoke going. I never seemed to get any substantial smoke either. I decided to far exceed the recommended smoking time to compensate and ended up with bitter tasting pork belly. Entirely my own fault. Make certain that any and all layers of foil are tightly pressed together and in firm contact with the wok. Again: great recipe!